Anne Tourney specializes in health and nutrition topics. She is a registered nurse with experience in medical-surgical nursing, behavioral health and geriatrics. Tourney earned a Bachelor of Science in nursing from Regis University. Agave nectar is a natural alternative to refined sugars and artificial sweeteners. This honey-like sap comes from the leaves of the blue agave, a succulent plant widely grown in Mexico. With its thin, light consistency, agave nectar can serve as a topping for fruit salads, pancakes or ice cream. This sweetener may also replace sugar in baked recipes. 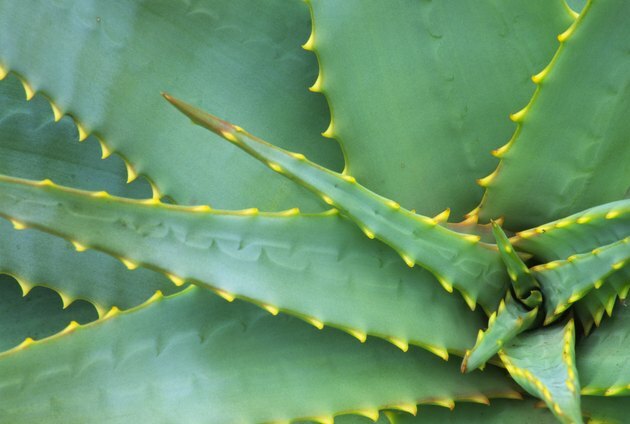 In addition to its versatility as a sweetening agent, agave nectar may provide certain health benefits. However, this syrup is still high in calories and may contribute to weight gain or tooth decay if consumed in large amounts. Proponents of agave nectar claim that this sweetener is a healthier choice for diabetics than sugar or honey because of its relatively low glycemic index value. The glycemic index, or GI, measures the effects of foods that contain carbohydrates on your blood glucose levels. Because agave nectar has a high concentration of fructose, which does not exert a strong effect on blood sugar levels, the GI value of agave is low compared to other sweeteners. "Diabetes Forecast" magazine notes that agave nectar contains approximately the same number of carbohydrates as sugar -- about 4 grams per teaspoon. To control your intake of carbohydrates and keep your blood sugar within a healthy range, limit your use of agave nectar as you would sugar or honey. Agave nectar is marketed as a natural sweetener, which may appeal to you if you're looking for a sweetening agent that's unrefined and free from additives. However, many brands of agave nectar do undergo some commercial processing before they're distributed to consumers. If you are concerned about preservatives, artificial coloring or other chemical additives in the foods you eat, look for brands of agave that bear the label "100 percent organic" or "organic." A food labeled 100 percent organic must be made entirely with organic ingredients, and a food labeled organic must be made with at least 95 percent organic ingredients. Agave nectar is 1.4 to 1.5 times sweeter than sugar, according to the Nibble, which means that you may need less of this product to sweeten foods and beverages. However, agave nectar has more calories than sugar -- 20 calories versus 16 calories in refined white table sugar -- which may balance out the total number of calories you consume. Despite claims that agave nectar is healthier than refined table sugar, this natural sweetener may not be any more nutritious than sugar or honey. According to the A Word on Nutrition website, the vitamin and mineral content is essentially the same as honey or sugar. Using agave syrup instead of honey or sugar may ultimately come down to a matter of personal preference rather than increased health benefits. Like other high-calorie sweeteners, agave nectar may contribute to weight gain or elevated triglyceride levels if you use it in excess. To enjoy agave nectar without compromising your health, include this product in your daily budget of discretionary calories after you've met your requirements for essential nutrients. What Is the Sugar in Diet Sprite?